This salad is the antidote to gloomy fall and winter days; in fact, it’s a celebration of the cold weather’s ability to produce beautiful, gem-like root vegetables. There’s salad to be made in every season! What a relief. 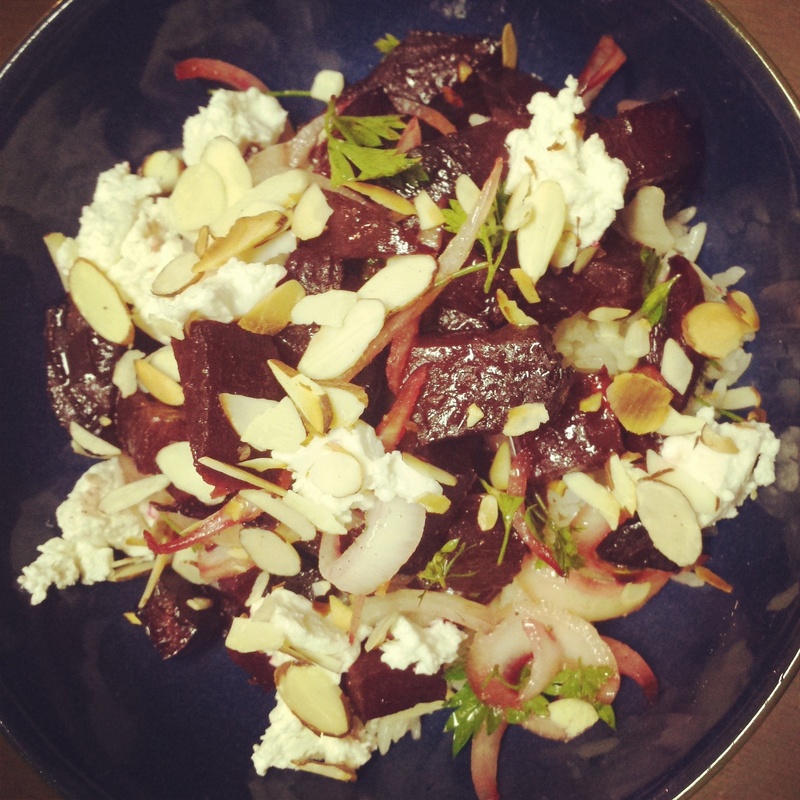 A great precursor for (or recovery agent from) your Thanksgiving starch consumption, this salad melds the earthy sweetness of roasted beets, the blunted creaminess of chevre, the warmth of toasted almonds, the brightness of lemon juice, the bite of onion and fresh parsley. It’s held together by a minimalistic drizzle of olive oil, and accented with celtic sea salt and freshly ground pepper. It’s great with the beets freshly roasted, warm over rice (cooked in bone broth for an extra nutrient punch), or cold by itself the next day – the flavors become friends in the fridge. That’s Scrubs playing on my tablet. Just trying to keep it real. 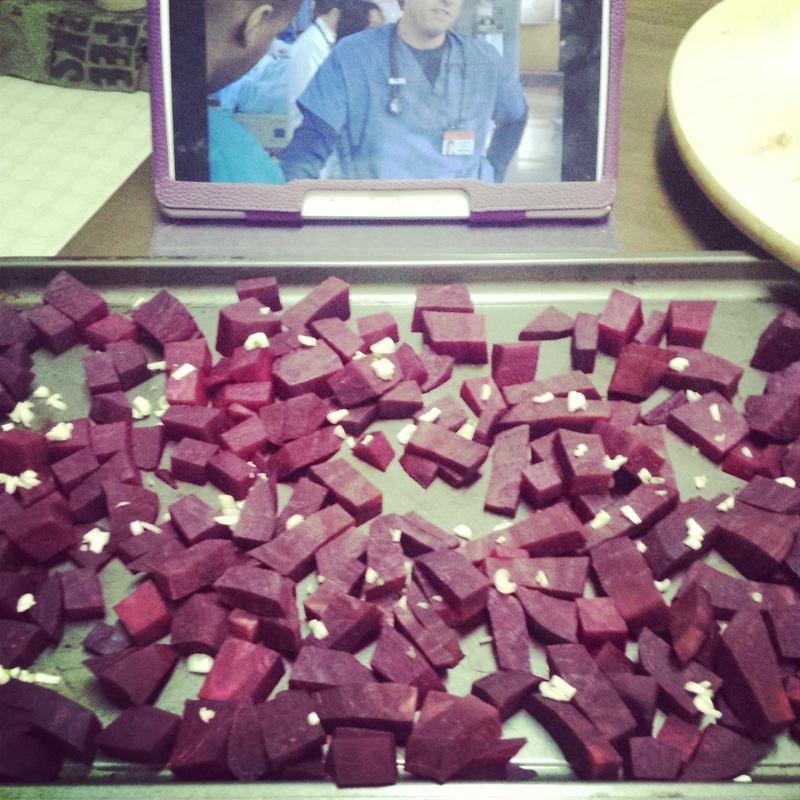 First, peel and dice some beets, then roast them in a 400-degree oven with garlic, olive oil, sea salt, and freshly ground pepper for 30 minutes, stirring once. Olive oil doesn’t retain the bioavailbility of its nutrients when roasted at high heat, but I do enjoy the flavor – so I use a lower-quality, Trader Joe’s California olive oil for roasting and save the extra tasty, California Ranch olive oil for drizzling at room temperature. 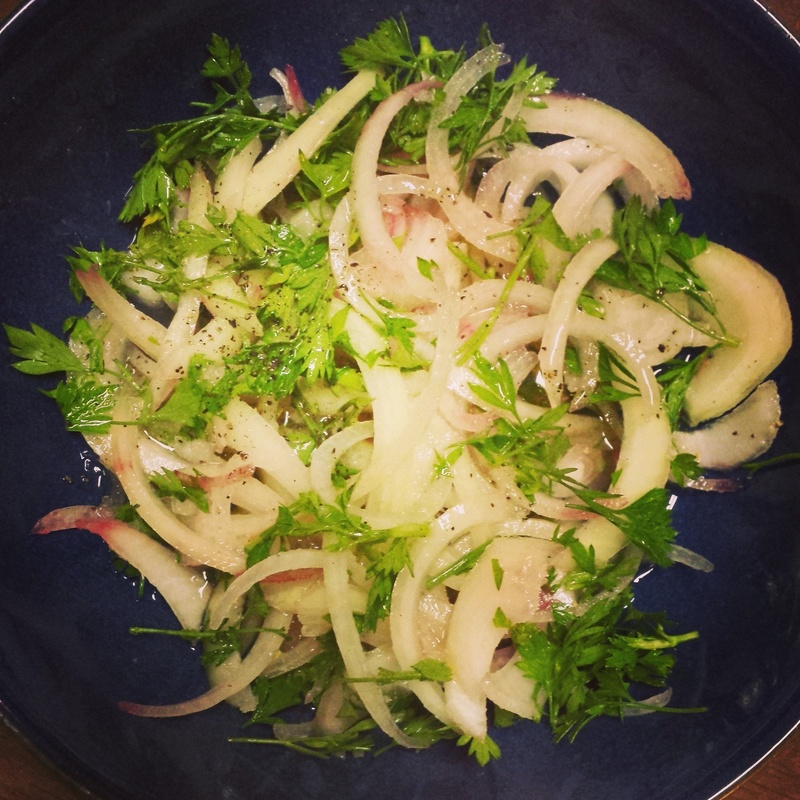 While the beets are roasting, thinly slice a small onion, mix it with freshly minced parsley (yay! My herb garden lasted through the freezing weather last week! ), squeeze the juice of two lemons into the bowl with a little more salt and pepper and a glug of best-quality olive oil. Toast sliced almonds in a small pan over medium heat for a couple of minutes, and chunk up some chevre. When the beets are roasted, scrape the contents of that pan into the bowl with your marinating onions and parsley, and mix. Serve immediately over rice and topped with the goat cheese and toasted almonds, or chill in the fridge overnight and serve as a cold salad the next day. Quantities are listed below. 24 Nov	This entry was published on November 24, 2014 at 6:02 pm and is filed under Collection. Bookmark the permalink. Follow any comments here with the RSS feed for this post.